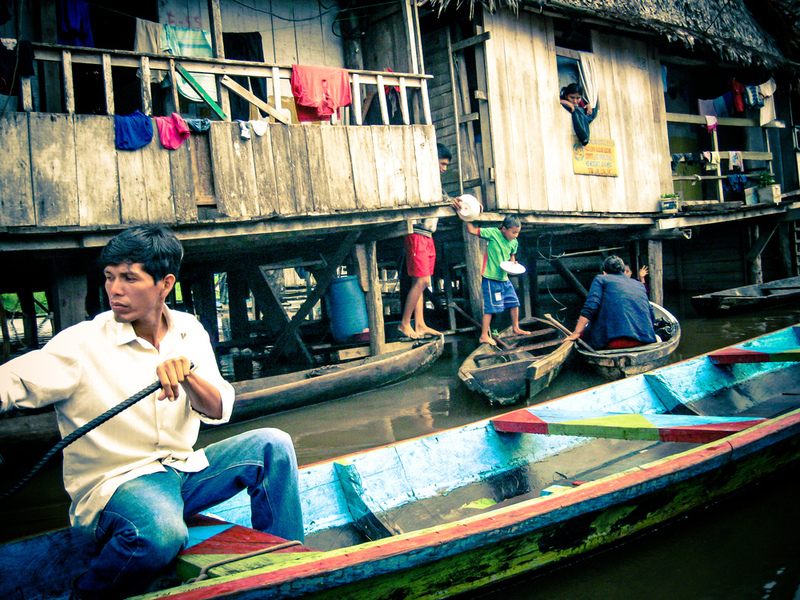 The neighbourhood of Belen Bajo exists on the outskirts of Iquitos, a city in the Peruvian Amazon. It is the result of people needing a place to live in the city, and building houses on the unclaimed banks of the Amazon river. The banks flood as the Amazon rises during rainy season, during which time families move to the second level of their houses and move around in canoes. As it is not an official neighbourhood of Iquitos, few houses have access to electricity or running water, and none have a sewage outlet. The kids from Belen rarely have the opportunity to express themselves or to show the world the reality of their daily lives. These photographs are a result of a photographic workshop with children of 9 to 11 years of age living near in Sector 7 of Belen Bajo. While traveling in canoes along the flooded street, the children learnt photographic techniques while capturing their neighborhood as they see it. The result is a collection of photographs that show this community from a unique perspective - the community, its fight for subsistence, and the personal lives of those within it. The photographs from the workshop have been exhibited in the Sector 7 Community Centre in Belen in 2012 and as well as part of the Sydney Latin American Film Festival 2014. Thank you to La Restinga, an association that works with the children of Belen, for their support.